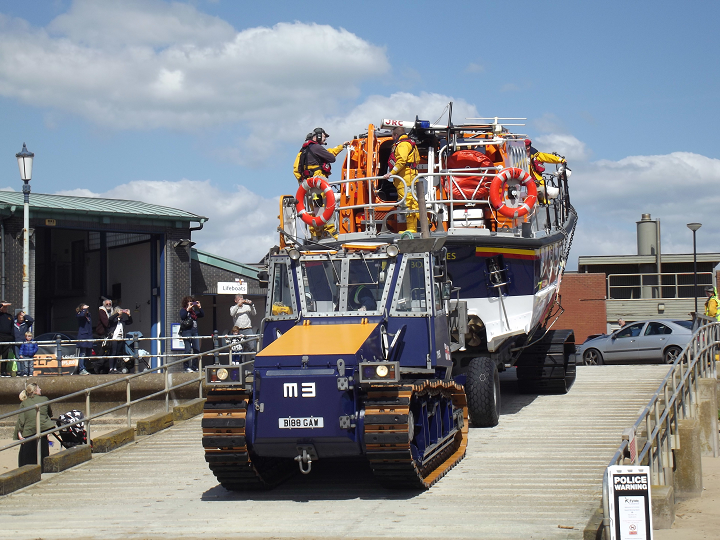 The Coastguard requested the Lytham St Annes Mersey class all-weather lifeboat Her Majesty the Queen launch to the aid of a 7 metre (23ft) yacht which had broken down in an east-north-easterly force 5, gusting 6 wind at lunch time on Thursday 4th May 2017. The vessel was unable to sail into the River Ribble with the wind dead against her and the failed engine prevented her motoring in. The Lifeboat under the command of Deputy 2nd Coxswain Nick Glassbrook set off at 2.30pm to rendezvous with the casualty off Blackpool. As it was low water in the Ribble the two vessels circled and then anchored off the entrance to the estuary channel while waiting for the tide to make enough water for the casualty to be towed over the Ribble Bar and on towards Lytham. The sea conditions with wind against tide were causing an unpleasant chop but the yacht was safely towed up to Church Scar, opposite Seafield Road. The station’s inshore lifeboat MOAM meanwhile put out into the river to take over the yacht and tow her on the last stage of the rescue up Lytham Creek to her berth at Lytham Dock. Launching at Seafield Road shortly before 6pm, the Inshore Lifeboat was back at her boathouse by 7.30pm having seen the three people and yacht safely into Lytham Dock. The Her Majesty the Queen returned to her Boathouse at 7.35pm after a service lasting five hours although the Crew and Shore Crew had to then set to for an extra hour to clean and refuel the lifeboat and tractors before they could leave for their meals. The annual Lifeboat Fun Run “Leg It for the Shannon Lifeboat” is the next fund raising way to help the Lytham St Annes Shannon Lifeboat Appeal and will take place on Sunday 14th May 2017 at 11am. Further details are available on the website www.lythamlifeboats.co.uk or from the posters in the Station’s two souvenir shops on Central Beach and South Promenade.